The fusion of marble, stone, metal and wood products is a bold design statement, but an innovative and creative combination for an avant-garde home. All of these elements are unified to create a luxurious and unique style, and you can work with your local Porcelanosa showroom to put together your own fusion of these natural elements in your home. Air Slate is made out of natural stone and is incredibly thin. Air Slate is available in slabs that are 47″x94″, making it an ideal product to use when covering large surfaces. Air Slate features a thin layer of fiberglass within the slab, which reinforces the material’s flexibility rate. Despite its large size, Air Slate can be transported and installed easily due to its lightweight features. 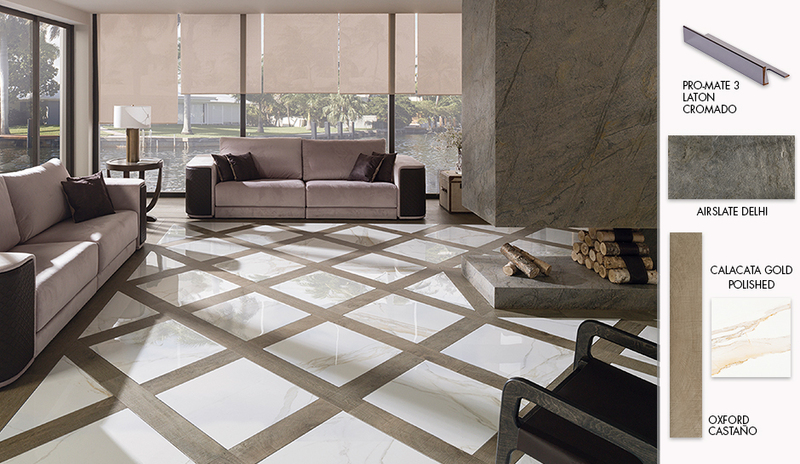 The Calacata series is one of Porcelanosa’s marble-look tiles that creates a pure and clean atmosphere in any application. The blend of white and gold colors in Calacata Gold adds a warm tone when accented with the other products from this selection. Oxford Castano is a wood-look porcelain tile from the PAR-KER® collection. The PAR-KER® collection of tiles has a wide variety of different shades and sizes, and combines the look of real hardwood with the numerous benefits of porcelain tiles. The Oxford Castano tile provides a striking effect when combined as an accent to the Calacata Gold floor tile, and helps bring out the warm, golden tones of the Calacata Gold tile. This Pro-Mate 3 Laton Cromado is a metal profile that features a gloss finish, and is used to decorate and separate ceramic wall and floor tiles with different designs and formats. This metal profile can be perfectly used to accent both wall and floor tiles and can help you transition from one material to another.